We bought paint to redecorate the tiniest bedroom in the house. 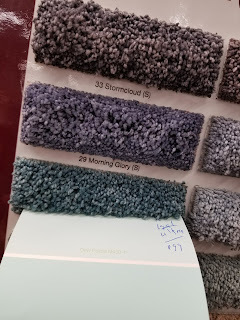 While we were waiting for the paint to be mixed, Jim and I wandered over to the flooring section and Jim got caught up in looking at flooring options for the kitchen/dining room. The sales guy got Jim hooked on thinking he could do an install of click-together flooring planks over our existing vinyl. 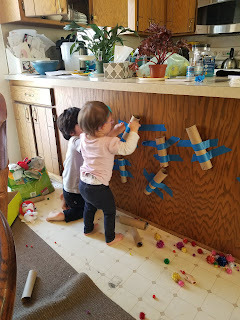 I guess I'm ok with it, heck, I'd love a new floor in the kitchen/dining area, but I am hesitant to just lay the new stuff over the old vinyl. I don't like that idea. I do think Jim could do the install himself, but it's probably harder than the sales guy made it out to be. Anyway, we got some samples which are currently lying on the floor in the dining room looking kind of too dark. But I plan on painting the cupboards white, so a darker floor will be ok.
Concerts in small venues are so much fun! Last night started off a series of four events in the span of a month and a half or so that we've been looking forward to for a long time. We saw They Might Be Giants at First Avenue. Jim and I started the evening with dinner at O'Donovan's across the street from First Ave. It's a cozy Irish pub (obviously). Jim had chicken pot pie and I had shepherd's pie (two days late for Pi day, sorry math). While we were eating, I spied a fellow thespian from "The Odd couple: female version," the guy who played Manolo. We chatted for a bit and he said he was going to the TMBG show also! We didn't see him during the concert, but it's interesting to discover that people you know have similar interests that you would not have guessed. Last Friday and Saturday, Katie, Jackson, and Emma came over to hang out. To keep us all busy, I pulled out a few old favorites for activities. I need to add a few more activities to the rotation, but these (and reading books, except not The Monster at the End of this Book, which apparently Emma does not like one bit) were heartily enjoyed, at least for a few minutes. I'm going to watch all the Mystery Science Theater 3000 episodes in order. It's a big job, but I've got to do it. I've already watched episodes 101 and 102. I had thought I had seen all the episodes that I own on DVD, but alas, I was mistaken--I have no recollection of either episode. And I'm half way through ep 103, and I have no memory of that one either. So I'm setting about rectifying the situation, and the ONLY way to make sure I see every single episode is to watch them in order. The ones which have not been released on DVD (sadly, there are over a dozen of them) I will have to search for on youtube and hope they are there. If not, we move on, sad but firm in the achievement of the goal. Others have done it, so will I. 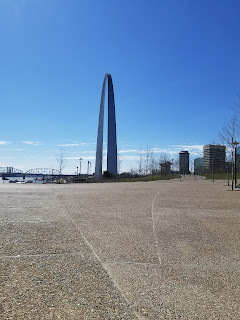 We almost didn't stop at the Arch, but as we got close, we thought "What the heck." Who knows when we'd be in St. Louis again, and as long as lines weren't hours long, we should take a driving break and experience the Arch. The only thing we had to get home to was the cat, and judging from the lack of texts asking when we'd be home, he didn't care all that much if we were late getting in. 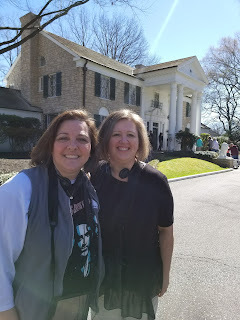 Jenni hung out with us on Saturday; she took us to Graceland. 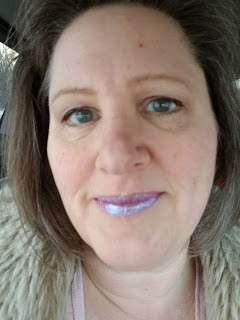 I'm not a Elvis fangirl by any means, but if one is in Memphis for any length of time and if one is at all an appreciator of rock 'n roll music, one must go see Graceland. Or, GRACELAND!!! It deserves all caps. I went mostly to see the Vegas years jumpsuits! And I would not be disappointed.